Read all about BLUEBOX in the industry press! 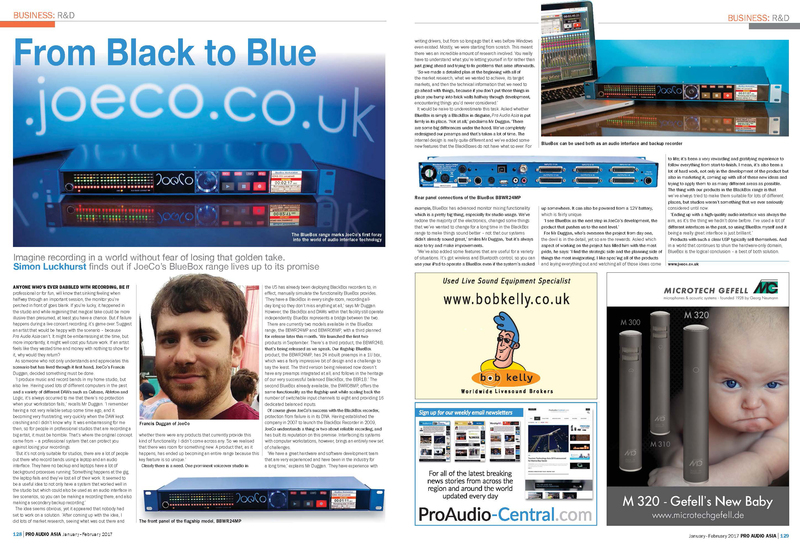 The BLUEBOX range of Workstation Interface Recorders is the star of two leading audio industry magazines this month, with both Pro Audio Asia and its sister magazine, Pro Audio MEA, having published a two page interview with JoeCo’s Francis Duggan. In the interview, Francis discusses hatching the idea for BLUEBOX, and talks about how that idea grew into the BBWR24MP, BBWR08MP and BBWR24B. The article – written by noted industry journalist Simon Luckhurst – also goes into detail about the renowned back-up functionality that makes BLUEBOX so unique. If you’ve yet to read the interview then you can find it by visiting the online home of the magazines, www.proaudio-central.com, and clicking on ‘magazines’ or simply read the interview here!